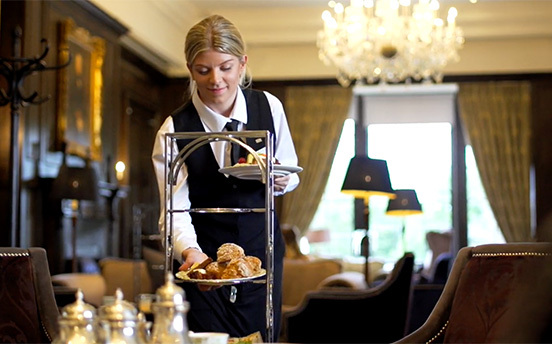 We filmed Oulton Hall and its golf resort as part of a wider project for QHotels that included 14 hotels in their portfolio. The brief was to create a 2 minute promotional taster for each hotel. For Oulton Hall we also captured aerial drone footage which worked well in doing justice to the setting as well as the extensive golf facilities. Situated just outside of Leeds – Oulton Hall is a relaxing, countryside getaway with its golf, spa and extensive leisure facilities. The 18th century property is surrounded by beautifully landscaped gardens plus there is a drawing room – perfect for afternoon tea or a champagne lunch. Two superb restaurants can be found within Oulton Hall and the Champagne Bar is the ideal spot for a celebration.